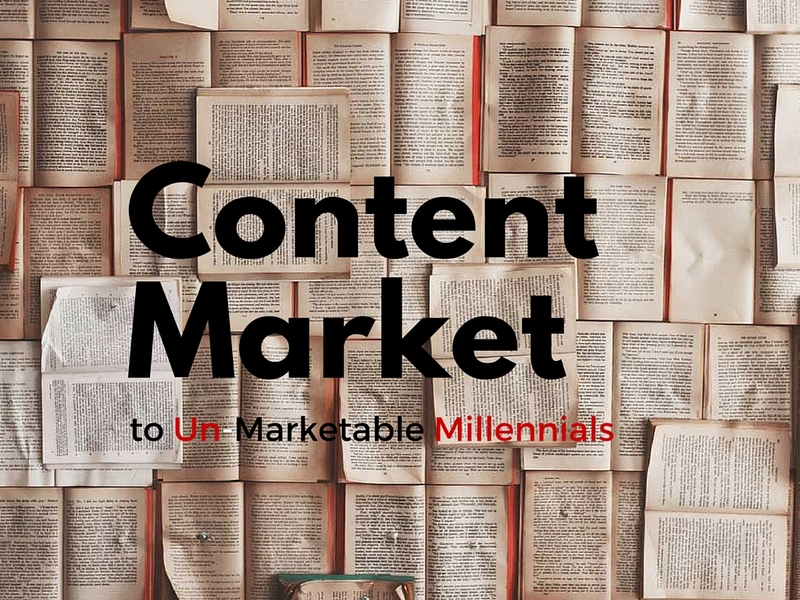 Content Market to Un-Marketable Millennials - SmackSmog! A recent study by the Pew Research Center made some shocking discoveries. The main discovery which exploded all over social media and then tradition media was that young people were more likely to have read a book in the last year than adults. We all shook our heads, rubbed our eyes, and cleaned out our ears in classic double take fashion. “What!,” we exclaimed. These horrid Millennials youths with their skinny jeans and over-sized smart phones are actually reading…and reading more than we civilized adults? I thought they only snap-chatted and went to electronic music festivals. When do they get time to read, we all wondered? Don’t they always have headphones on anyway? How could you do this to us, trusted Pew Research Center? You are beyond repute, we tiny mortals cannot call into question your findings. But wait? Is that a hint of silver on those clouds? If these youths are in fact reading it works in your favor if you are trying to gain their product loyalty. For the last few years Millennials have been a huge question mark to businesses. The main issue being how do we get them to buy our products. They seem so independent and tech savvy. They don’t like established norms. Most have even stopped using banks or plan to in the future. They are all the same but totally different so how do you sell them your stuff. This is exactly where content marketing is crucial. However, it is “like totally important to remember”it must be high-end content or else they will stay away. The one thing they can sense faster than an artisanal pickle shop from miles away is insincerity and fakery. What you present on your site has to be almost painfully authentic. So how do you present your product in a way that is inviting for the younger generation? First the content has to be fresh and consistent. Is your product something that has been in the marketplace for a while? Find a new spin and run with it. The political arena has been doing it for years. Once you have nailed down your spin you need to ensure it does not come across as disingenuous. Here is where authenticity and good writing come into play. And guess what? There are companies around that specialize in doing exactly that (See what I did there? That was a plug and you never saw it coming, or if you are smug enough, you probably did). A skilled content writer can market your product without getting in your face. Basically, the product can speak for itself. Do people like using it? Great! Then fill your site with reviews from ordinary people. Maybe add your own comment section, where people can leave their own comments and show their friends how clever and esoteric their review was. Read the comments and reviews on Amazon and it proves the point. This new group of young millennials consumers want information about your product and they want to interact with the information. This does not mean you litter your site (or preferred marketing venue) with “click me” links or pop ups. Don’t be the website that as soon as you log on has a pop up to sign up for the newsletter. First, with all the spam going around people are more likely to share their social security number with you than their email address. I am not saying you should not have a sign up, but let the consumer look around first. Let them check out the neighborhood before signing the lease. If you provide quality content on a consist basis the kids will come running. The good thing is that great content doesn’t just attract the youth but will also bring most consumers to your product. You just need to1 decide who your company is, who your key demographic is, and what you want to say…the easy stuff. If you decide the “youths” are not who key demographic is, it won’t matter because your content will call to them faster than an organic yogurt shoppe. It is the bonus of content marketing. Smack Smog is here to help you with your Online Marketing. We can help your organization with creating content and distributing it online. Millennials aren’t the only ones who want good content. As we mentioned above the Millennials are like the rest of us from the point that they want honesty and quality over quantity. Smack Smog always give quality and that means that we always give you our best! Contact us today to find out more about how we can help you market to Millennials!